The Great Pyramid Inn is located in the shadows of the Great Pyramids of Giza and sphinx. We have a free WiFi service in all areas and rooms of the Inn. We offer shuttle service to pick you up from the airport free of charge. Guest can enjoy a complimentary free breakfast from our range of Egyptian and oriental food. There is a bar. The Great Pyramid Inn restaurant offers delicious and tasty oriental food of grilled and barbecued food while enjoying the pharaonic atmosphere. The hotel is suitable for all ages and also the reception is open 24/7. The hotel located just 5 minute walk from these wonders of the ancient world offers unmatched views of the pyramids, sphinx and 30 minute drive away from the Pyramid of Saqqara. You can gaze and enjoy the magnificence view of the pyramids from your rooms watching sunrise, sunset, the desert and sound and light show each evening. Feel at home with our charming guest rooms that offer private bathrooms, LED TVs, air conditioners, closets, delightful décor, dryer and refrigerator and incomparable view. We have single, double (can be setup as twin) or triple rooms available. 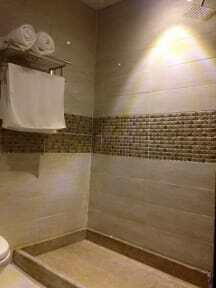 We offer also: Room service 24 hours, Concierge service, TV Area, Laundry, Dry Cleaning, Ironing service, Daily housekeeping, Fax and Photocopying and Pharmacy. Fantastic experience from the moment we were picked up by their complementary airport shuttle service. The staff helped take the hassle out of visiting a new country that sees a lot of tourists by arranging a great English speaking driver -Adel, 10 stars just on his own! - and making sure everything we needed was taken care of. Great location - can’t beat the view of the pyramids from the terrace - clean rooms that were taken care of everyday, and fantastic service; worth it enough to come back! Can’t beat this location, staff and breakfast also amazing. Option for a 3 person room isn’t the most comfortable because it’s an old pull away bed with a bad mattress but it’s pretty affordable so better to just book 2 rooms if the bed matters to you, it didn’t bother me but my travel companions couldn’t sleep on it. Amazing place place! Great location! The entire staff was VERY helpful and made my exploration of Egypt better than I expected. Amazing view of the Giza Pyramids from their rooftop balcony and their rooftop restaurant had amazing food! Ask for the restaurants maitre d, Ali...he will set you up! I will definitely return again!!!!!! Great spot! Super easy to get to the pyramids. You might get bombarded with tourist package suggestions, but they are very understanding if you aren’t interested. They made the camel tour of the pyramids very easy! Dinner is a must-have, pleasantly surprised with the quality of food and service. Can’t beat the view either! I had a quiet room that was very comfortable. Would recommend! I couldn’t of asked for a better location and view for the pyramids. 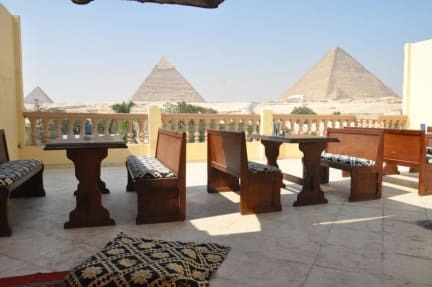 This hostel is literally located outside of the Sphinx and Pyramids entrance. My room unfortunately didn’t have a view of the pyramids but the room was clean and comfortable. The hostel staff were great and accommodating. We booked a pyramid guided tour, sunset camel ride and sunrise ATV ride with them as well as airport pickups. The restaurant view is unbeatable and the food was great. Big breakfast to get your day started. Off the beaten Path location that is like a hidden gem. The owners and people who manage the place make you feel secure and welcome. Very close to the Sphinx and Pyramids. Good food, they even spoil you a bit. Would definitely stay again. This is a great place, the view from the rooftop terrace is spectacular, because the hotel is practically located across from the entrance to the pyramids. You can have dinner at the rooftop and watch the evening light show. I loved this place and regretted not having stayed there longer! The view from the rooftop restaurant and bar is indeed awesome in terms of the sound and light show at the pyramids. Also, the staff is very friendly and helpful. Breakfast is varied and filling, plus the orange juice is the best I've ever had anywhere. However, there was a crazy man yelling periodically for almost 2 hours beginning at 3:30 in the morning right below my window. Somebody really needs to do something about him, as I didn't get a decent night's sleep before a long day. The service and the location are excellent. The rooms are clean. However if you are in the rooms in front (with Pyramids view), the noise from the street is annoying. Hotel is not recommended for disable people since there are many stairs. Hostel world overbooked this place! When I arrived, they said there was no room conformation for me. I would like a refund of my deposit and an apology for this!